If you haven’t been keeping up with football all season, here are some things you should know before watching the big game on Sunday. 1) A major part of the game is going to focus on the legacy of Peyton Manning. Several key things make this game huge for Manning. For one, if the Broncos win, Manning will be the first quarterback in NFL history to win the Super Bowl for two different teams. (In 2006, he led the Indianapolis Colts to a 16-14 win over the Chicago Bears.) This is also Manning’s second season back after having neck surgery, which many thought would put an end to his career. Of course he proved them all wrong. Now at 37 years old, despite surgery and being let go by the Colts, he has the perfect chance to make a final statement about his career. Although there is speculation that he will retire if he wins, in interviews he has said he’d like to continue playing football. Either way, a win in this game would ensure his legacy as one of the greatest quarterbacks in NFL history. 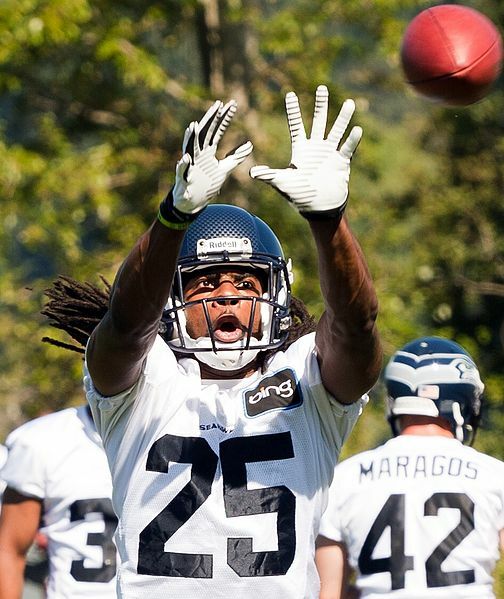 2) Richard Sherman will also be at the forefront of the game. 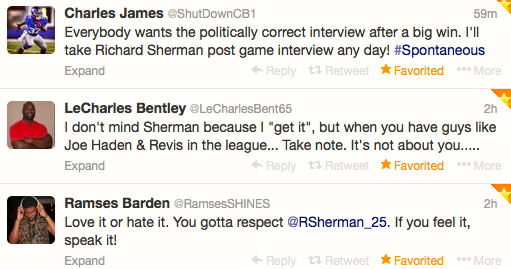 As most of us have seen Sherman’s interview after the NFC Championship, all eyes will be on him this Sunday. As a cornerback, his job is to cover receivers in the back field, and for the Super Bowl he’ll most likely be matched up in man-to-man coverage with Broncos star wide-receiver Demaryius Thomas. Make sure to watch for the two of them going head to head during the game. 3) The Broncos have the #1 offense in the NFL while the Seahawks have the #1 defense. 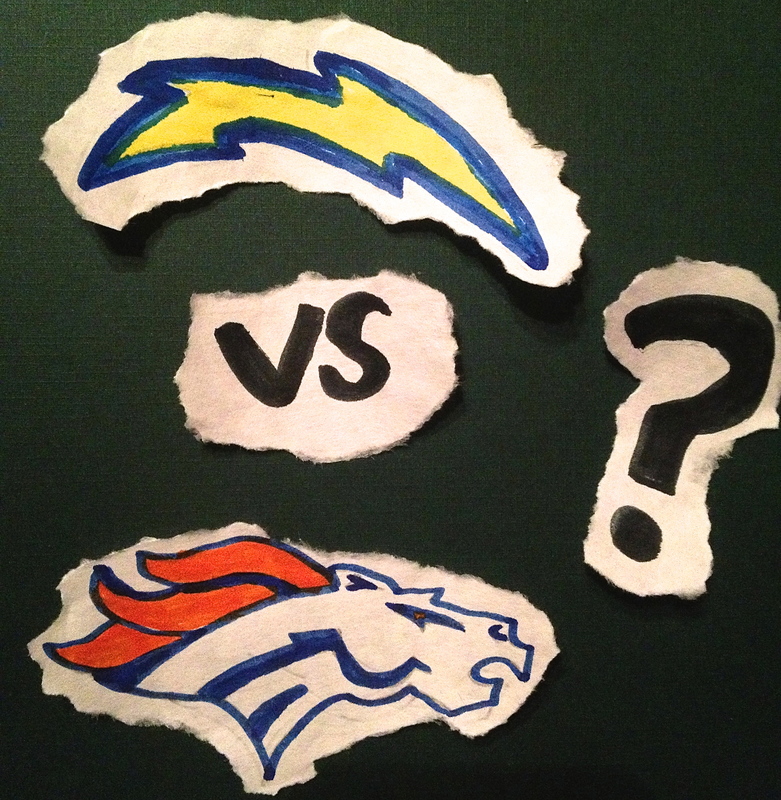 This is a pretty even match up and most experts are 50-50 in their predictions of this year’s Super Bowl Champion. According to the spread in Las Vegas, the Broncos are predicted to win by 2.5 but I’ve seen other betting websites predicting the Seahawks to win. Basically, it will be a close game. 4) The Seahawks have never won a Super Bowl title. Although the Seahawks have been in the Super Bowl one time in 2006, they have never won, losing 21-10 to the Pittsburgh Steelers that year. They have a fairly young team and only one team member, receiver Ricardo Lockette, has ever experienced a Super Bowl. The Broncos, on the other hand, have made it to the big game six times, winning two of them. 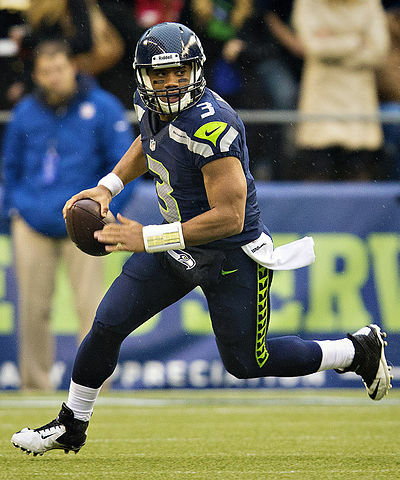 5) Seahawks quarterback Russell Wilson is only in his second year in the NFL. As such, he is still known as a NFL rookie. During his first season with the Seahawks, he led them to the Divisional round of he 2012 Playoffs where they lost to the Atlanta Falcons 30-28. If the Seahawks were to win this Sunday, the MVP may not be Wilson, and would likely go to running back Marshawn Lynch instead. However if the Broncos win, the MVP will 100% be Peyton Manning. 6) You should know about the 12th man. This is what the Seahawks fans are known as. 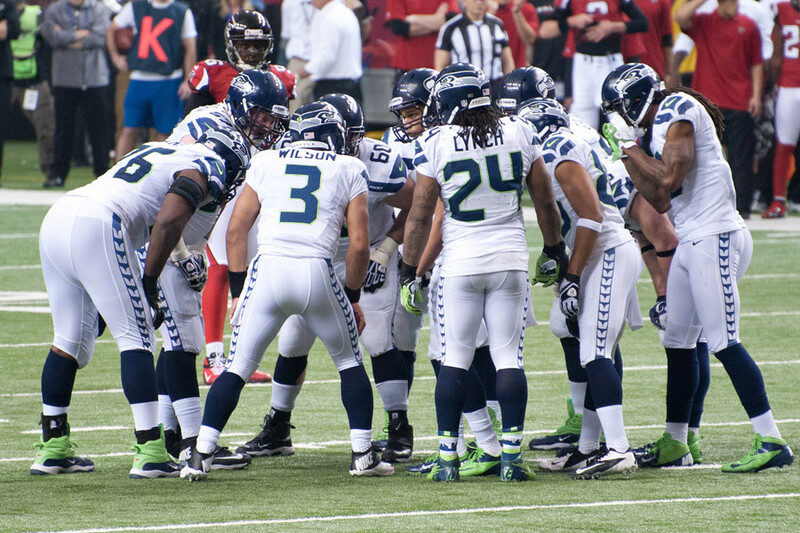 In football, there are a maximum of 11 men allowed on the field for each team at one time. 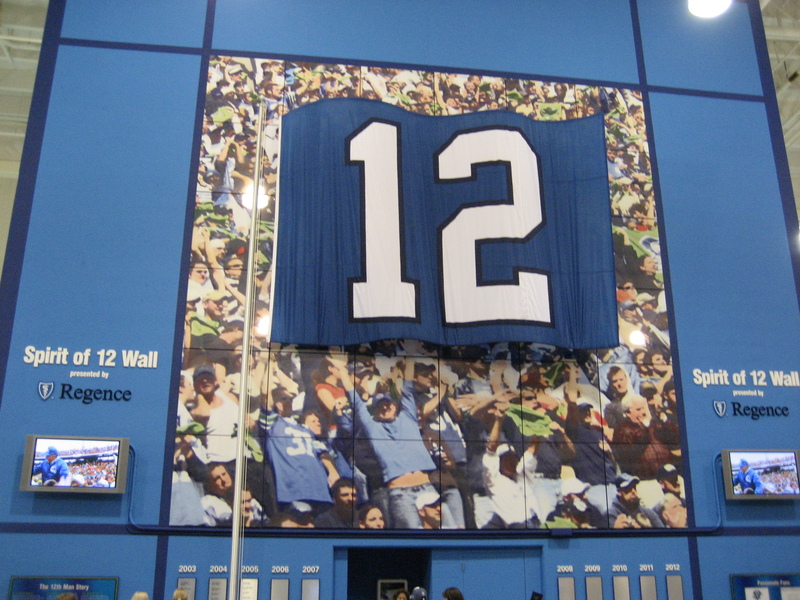 Fans are known as the 12th man, because they are a part of the game as well. The Seahawks really value their fans and will always reference the 12th man because their fans have helped them win through their support and loud cheering. (Their stadium is the loudest in the NFL.) Often, you will see Seahawks fans wearing jerseys with a number 12 on the back of them in reference to this. These are definitely some basic facts you should know before watching tomorrow’s game and if you watch pregame as well, you should hear a lot more about the background of many players and the teams. Whether you’re a die hard #18 fan, a proclaimed 12th man, or none of the above, this year’s Super Bowl is sure to be an exciting one. T-minus one week until the Super Bowl and if you’re planning on hosting a Super Bowl party, there’s a lot you have to do before kickoff! First, you have to decide who’s coming. For me, I generally stick with family because I know they’ll understand that I rather watch the game intently and not speak. In my Sports Media class the other day, we were talking about Super Bowl parties and how they generally involve friends trying to talk to you, ask you what’s happening, or who you think is going to win during the middle of something important. 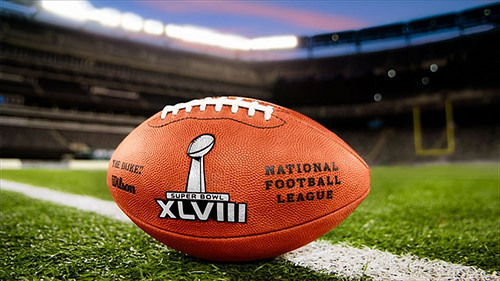 In the Super Bowl, even commercials are important so there’s not much time to talk! If you own two TVs, a good solution is to have one area where the intense watchers can see every second of the game, and another area where the people that want to socialize can watch. Now… how should you decorate? Some people like it simple, but for those of you who want football decorations everywhere, you can get plenty of cool items to make your party stand out. 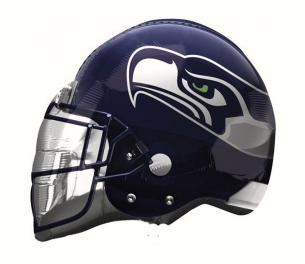 If you’re not a fan of either of the teams go for some decorations with the Super Bowl XLVIII logo on them. I love these balloons from Party City, but the balloon bouquet is definitely my favorite! 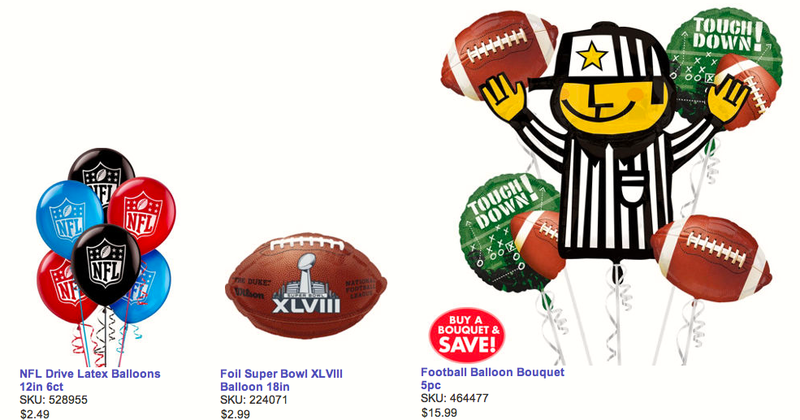 Party City in general has a lot of great Super Bowl decorations so you can check them all out here. 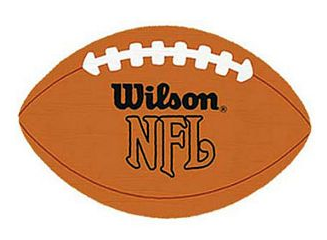 You can get NFL tablecloths, football shaped confetti, banners, or basically anything shaped like a football. 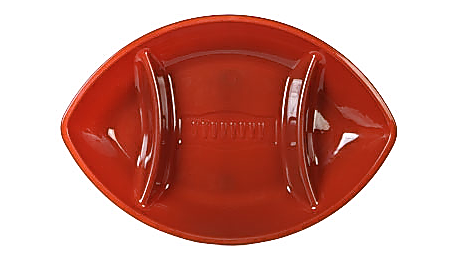 If you want to save money, dollar stores often have football party supplies and Dollar Tree in particular has a football shaped chip and dip tray. If you want to spend a few more dollars though, you can get one at Party City too that’s a little fancier. 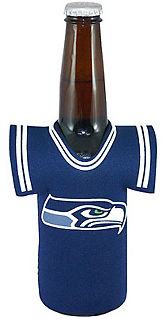 If one of your teams is in the Super Bowl, you can have even more fun with the decorations and supplies for your party! Again, balloons are great for any party, especially tied to the back of each chair, or placed in the corners of your house with balloon weights. 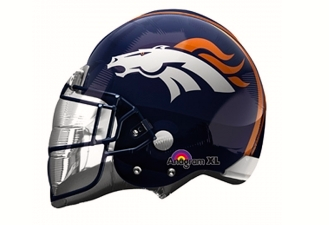 Whether you’re a Broncos or Seahawks fan, these helmet shaped balloons from birthdaydirect.com are awesome! 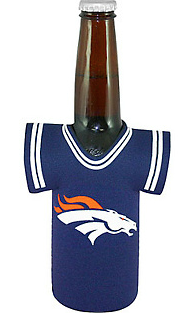 Broncos and Seahawks fans would also both love these Party City “bottle jerseys” to spruce up any drink and represent your team. ‘Cause what’s better than you and your drink both wearing a jersey, right? Next, we can’t forget the food. You can go the classic route of store/restaurant bought pizza and wings, nachos, or chips and dip, but you can also try something a little different. You could cook up something yourself or to make it easier on you, give your guests a “serve yourself” option. With frozen yogurt and ice cream toppings bars becoming more popular, why not make a Super Bowl toppings bar! Whether your guests top their nachos with whatever they want from beans to jalapeños, or choose their own pizza toppings, this will definitely make your party more fun! 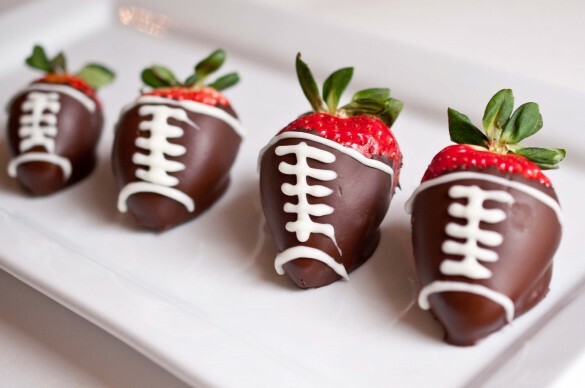 As for dessert, I love this idea from domesticfits.com… Football chocolate covered strawberries! Another simple, but fun dessert you could have at your party, is a frosting decoration station for brownies and/or cookies. Your guests can design whatever they want on their desserts whether they choose to draw their team’s logo or Richard Sherman’s screaming face. There are so many options, everyone will have something cool to show, and you can even make a contest out of it. 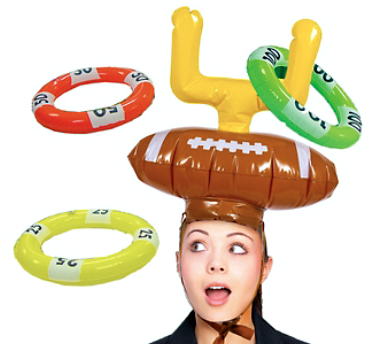 Speaking of contests… if your Super Bowl party is going to be more social and interactive, why not add some party games? You don’t need anything too fancy, but this inflatable ring toss game is a funny way to pass time if there’s a free moment during the game (you know… if a black out or anything else happened like that). If there are going to be any kids at your party, I’ve also seen football shaped pinatas which would keep them entertained for at least a part of the game. Last, but not least, what are you going to wear to this party of yours? If you own any Broncos or Seahawks apparel, definitely throw that on, but if not, there are ways you can root for a team without buying a $30 shirt. When the NY Giants were in the Super Bowl in 2011, my whole family bought the NFC Championship shirts and wore those, but we also got Giants face tattoos. 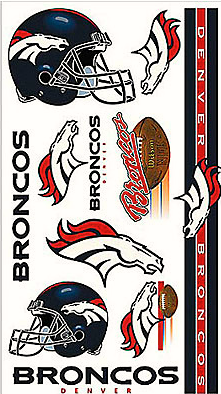 If you’re rooting for a particular team, buy a $4 pack of tattoos, throw a few on, and you’re all set! You could also get team eyeblacks or draw a #18 on your face if you’re a Peyton Manning fan. If you’re not into either team, wear the apparel you own from your favorite team in spite of it. Not going to lie, I definitely wore a Giants shirt during last year’s Super Bowl and will probably wear my Peyton Manning Colts jersey this year. Whatever sporty clothes you have in your closet would probably do fine, but if you want to really represent, there’s nothing better to wear than an AFC or NFC Championship shirt or a team jersey. As for those of you who want to just focus on the game and not deal with all of this party craziness? There’s no way you can go wrong with a room full of cheering family and friends, surrounded by a ton of delicious food. If you watched the NFC Championship game between the San Francisco 49ers and Seattle Seahawks, you probably aren’t really thinking about what happened during the game, but instead what happened after it. If you haven’t heard from the massive outpouring of comments on social media, during a post-game interview, Seattle cornerback Richard Sherman yelled, “I’m the best corner in the game. When you try me with a sorry receiver like Crabtree, that is the result you are going to get. Don’t you ever talk about me.” After reporter Erin Andrews asked, “Who was talking about you?,” he continued to shout, “Crabtree. Don’t you open your mouth about the best, or I’m going to shut it for you real quick.” If you want to see the interview in all it’s craziness, it’s below! Some tweets showed support for Sherman in what he said, with most of the tweets mentioning that he was passionate, football should involve trash talk, or he was just pumped up and his great play is what ultimately mattered. Others called him “classless” and “dumb,” said they lost respect for him, or pledged to root for the Broncos in spite of him. Well, Crabtree was recently asked by reporters if he thought Sherman was the best corner in the game, and he responded saying, “No, I don’t think so.” Okay… so that was what Sherman was referring to amidst his shouting! However here’s what I find funny. Sherman’s tweet says, “A lion doesn’t concern himself with the opinions of a sheep.” If Sherman wasn’t personally offended by what Crabtree said in his interview, than he wouldn’t have defended himself in that manner. He’s going to the Super Bowl after all, so ultimately he got the better end of the deal anyway. 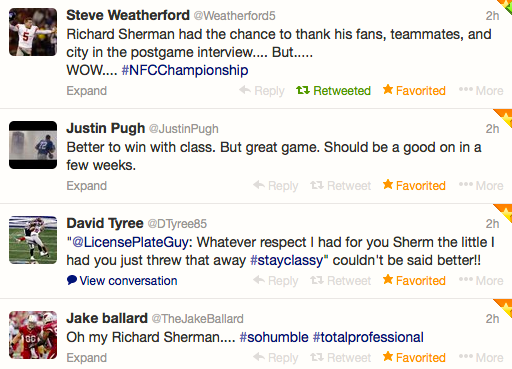 Clearly his reaction tonight showed he was in fact concerned with Crabtree’s opinion. No, Richard Sherman, you’re not the number one corner in the game. You’re number six. Now please don’t be offended by this and come screaming at me too. With the Seattle Seahawks and Denver Broncos both being the top seeds in their respected conferences, saying Super Bowl XLVIII would be a Wilson vs. Manning game, may not be the greatest surprise, or the classic underdog story we all love. As predictable as this is, these two teams face to face would make a more memorable Super Bowl in the end. The non-football watcher, would probably say, “The 49ers were just in the Super Bowl last year, let’s see someone different.” Same goes for the Patriots. Tom Brady already has multiple Super Bowl victories so it’d be a little more exciting to see someone else hoisting up the Lombardi trophy. Personal bias aside, I do actually have some facts to back up my prediction. It’s not my inner Giants fan rooting for Eli’s big bro and not wanting the Patriots, a Giant’s rival to be in it. The season’s stats so far show the Broncos and Seahawks have the better teams and should therefore make it to the Super Bowl. Let’s look at the Broncos vs. Patriots first. Rushing Game: The Patriots mainly give touches to LeGarrette Blount and Steven Ridley who both finished the season with 7 touchdowns, with 772 yards for Blount and 773 yards for Ridley on the ground. With Blount’s 166 yard game and 4 touchdowns (the Patriot record for rushing touchdowns in one game) against the Colts in their 43-22 win this weekend, he’ll get the majority of the ground work for Sunday’s game. As for the Broncos, with running back Knowshon Moreno getting the brunt of the work with occasional touches by Wisconsin rookie Montee Ball, both have the power to make significant plays. With 1,120 yards for Moreno in the regular and post seasons, his consistency this season will add to the big plays Manning is sure to make. The consensus? : The Patriots will take the edge on rushing yards with Blount and Ridley’s combined efforts. Passing Game: Tom Brady has two major targets in Julian Edelman and Danny Amendola, while Peyton Manning has Demaryius Thomas, Wes Welker, Eric Decker, and Julius Thomas. Manning’s options all land within the top 44 NFL players for total receiving yards on the season. The Patriots no longer have Gronkowski due to his ACL and MCL injury in Week 14, and with two less dependable receivers than the Broncos, that may be the game changer. Basically, the less viable targets, the less passing yards. Plus, it’s Peyton Manning we’re talking about. With the most passing yards in the NFL this season and his 115.1 QB rating, it’d be a safe bet to say he’s going to have yet another huge game on the passing front. 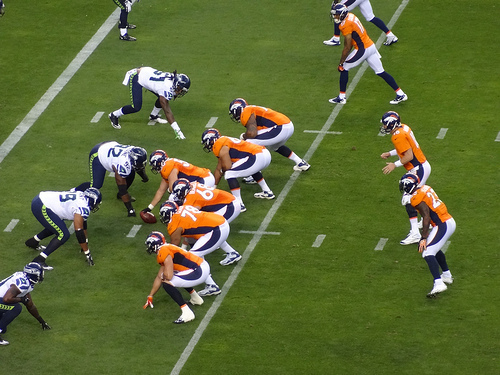 Consensus: Broncos take the passing game with Manning and his many targets. Defense: The Patriots defense essentially sealed the win in their divisional game against the Colts. With three sacks on quarterback Andrew Luck and four interceptions (two of them by Pats cornerback Alfonzo Dennard), the Patriots defense led by Jamie Collins will have even more confidence going into this weekend’s game. However with Bronco’s cornerback Chris Harris Jr. out with a torn ACL after last weekend’s win against the Chargers, they’ll need to find a replacement to fill his large shoes. Head coach John Fox hasn’t made a decision yet, but I’ll bet that Champ Bailey will be in the cornerback position for the majority of the game. He won’t be at his 100% best because of his left foot injury that has been continuously giving him trouble, but will be a decent replacement. Consensus: The Patriots defense will be strong, forcing at least one turnover and breaking through the Bronco’s offensive line to get to Manning. The Broncos offense, however, will keep them in check and ultimately diminish the Patriots defensive efforts. Broncos have this one. Special Teams: I’ll keep this one short. The Bronco’s Trindon Holliday is likely to give Peyton Manning and company consistently good field position. Ideally for the Broncos, he may even return a punt for a touchdown as well. Consensus: The Broncos special teams will help ensure a Denver win. Aside from these predictions, what is sure is that it will be a very close game. Yes, the Patriots defense has been playing better than usual as seen by their recent win, and the Broncos have some injuries plaguing their defense, but Peyton has all four of his receivers healthy. Manning and these four will make all the difference. 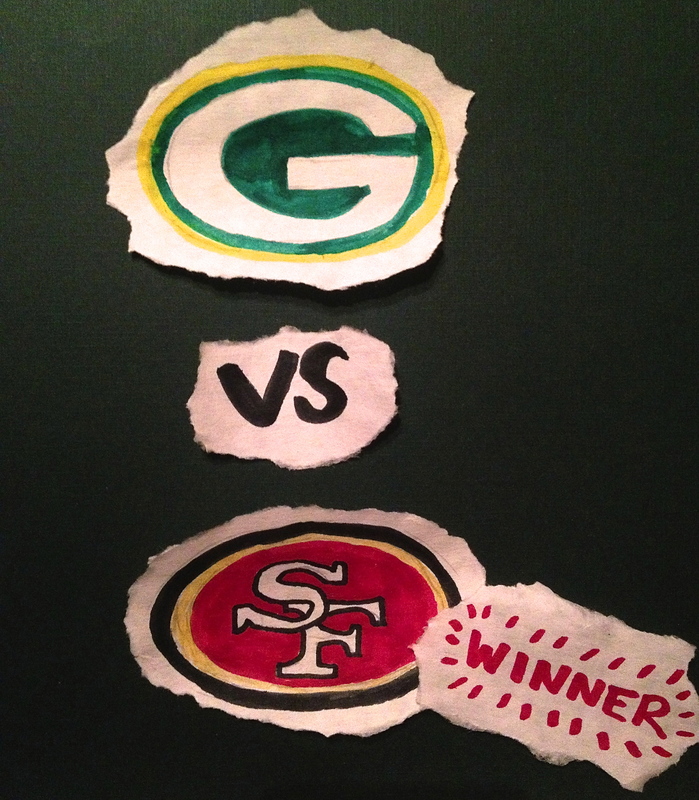 Now for the Seahawks vs. 49ers. Rushing Game: Marshawn Lynch will dominate the field as usual. With 1,403 yards in the regular and post season combined, he’ll probably add more than a hundred yards to that number this Sunday. Although Frank Gore will most likely give the 49ers a touchdown or two, he won’t be able to keep up with the 100+ yard game Lynch is going to have. I predict he won’t break over the 100 yard mark at all. 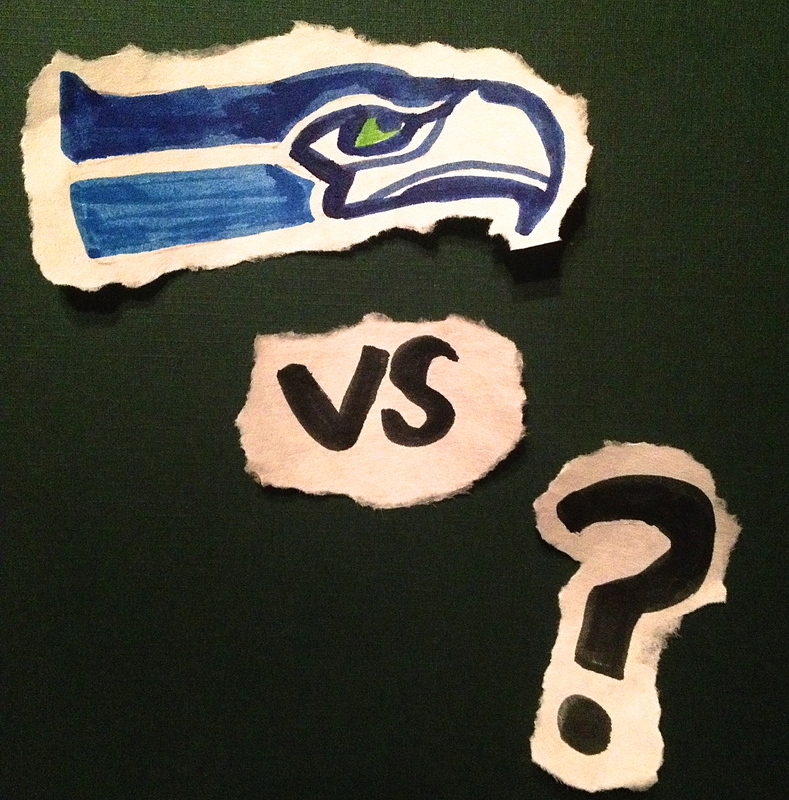 Consensus: The rushing game with the help of Lynch will help ensure another victory for Seattle. Passing Game: Although Russell Wilson had a disappointing divisional round and beat the New Orleans Saints thanks to the Seahawk’s rushing game, we should see a better week from him. Golden Tate will get the majority of Wilson’s completions, but Doug Baldwin will also be there making several key catches. I don’t expect an amazing, extraordinary game from Wilson, but just enough to win the game. The 49ers have Anquan Boldin and Vernon Davis, both who are bound to make several big catches and get into the end zone. Crabtree will be there to make a few solid catches as well in crucial 3rd down situations. Kaepernick, on the other hand, has had less than stellar games versus the Seahawks this season with 15 completions on his 29 attempts in their Week 14 meeting. However this time around, we should see him make some big plays in the air and on the ground, possibly getting into the end zone himself. Consensus: The 49ers win this category as I see Boldin and Davis collecting more receiving yards than Tate and Baldwin of the Seahawks. Consensus: The Seahawks will force several turnovers with their defense consisting of cornerback Richard Sherman and star safety Earl Thomas. Special Teams: The Seahawks have had a consistently excellent special teams unit. With kicker Steven Hauscka’s 94.3% field goal completion rate, their special teams should positively impact the outcome of the game. In the Seahawks and 49ers last meeting, San Francisco’s Phil Dawson kicked a field goal to win the game, and he will again prove useful in tacking on 3 extra points here and there to keep the 49ers in it. Consensus: Special teams will both make beneficial contributions but the Seahawks should make a few more field goals to keep the win safely in their grasp. With the almost deafening noise volume at the Seahawk’s CenturyLink field, the 49ers will have to try their best to keep their sanity, but ultimately will fall short if only by a few points. Okay yes, I personally want a Seahawks vs. Broncos Super Bowl, but with the Bronco’s offense under the helm of Peyton Manning, and the Seahawk’s having the number one defense in the NFL, it is more than likely to end up that way. As the playoffs are in full swing with one game finishing a few hours ago, two more games tomorrow, a championship game for each division, and finally THE SUPER BOWL, I thought I might simplify the playoffs for those who find the whole thing confusing. Since some of us don’t like reading those lengthy sports articles, would rather watch a reality show instead of SportsCenter, or only watch their team’s games, a visual representation of “who’s still in it” will get you all of the info you need to be knowledgeable at those upcoming Super Bowl parties! To start off, there are four rounds of playoffs. First, the Wild Card Round, second, the Divisional Round, third, the Conference Championship Round, and fourth and finally, the Super Bowl! 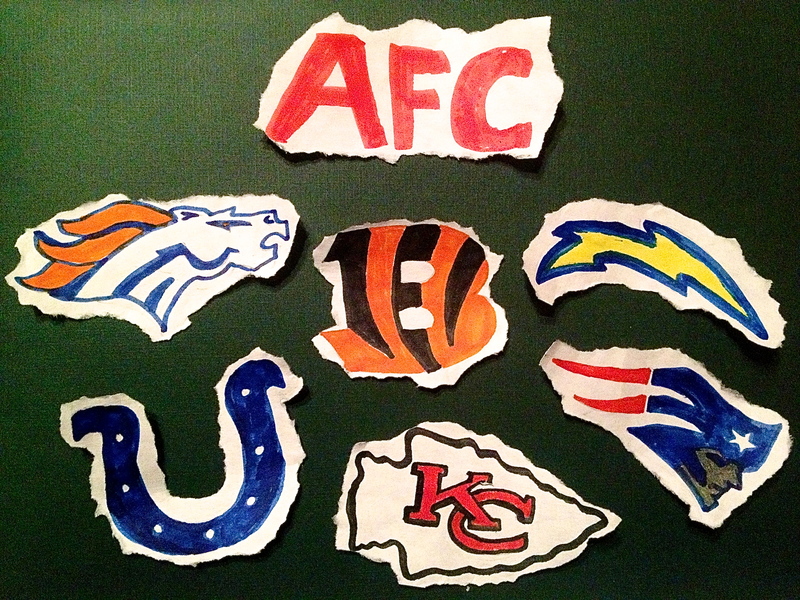 Six teams from each of the two conferences make it to the playoffs and this year the teams for the American Football Conference (AFC) are (left to right): The Denver Broncos, Cincinnati Bengals, San Diego Chargers, Indianapolis Colts, Kansas City Chiefs, and New England Patriots. 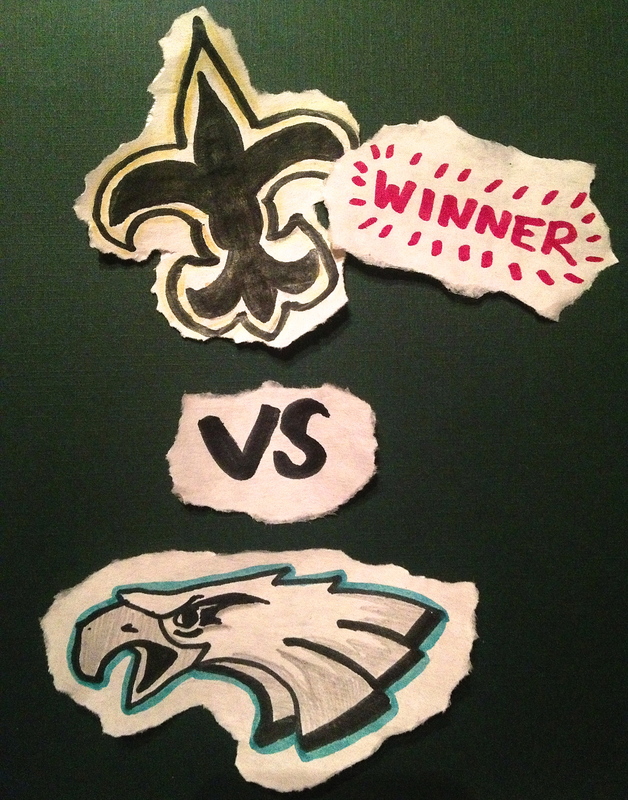 As many of us have a visual memory, I thought using the team’s logos would help you remember which team played which, who won, and who’s continuing on in hopes of making it to the Super Bowl! Now as the Super Bowl works, the top AFC team plays the top NFC (National Football Conference) team. 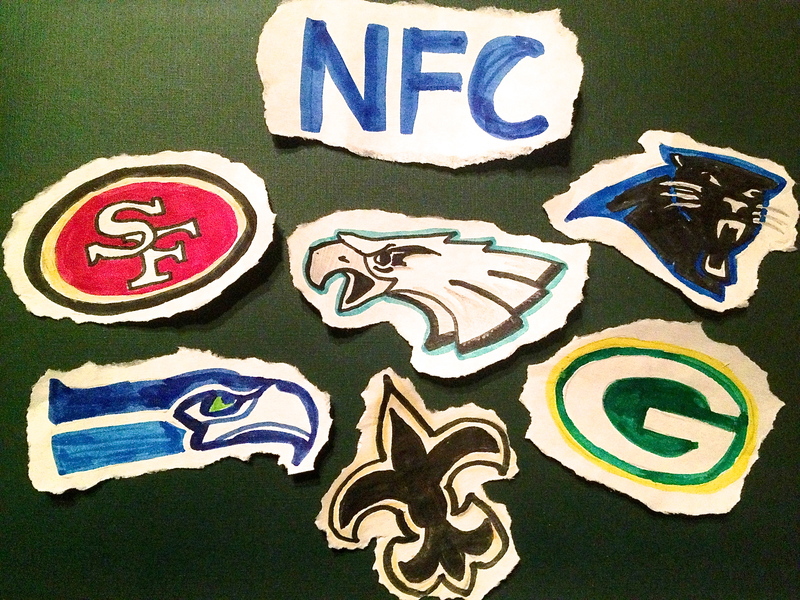 Again, there are six teams in the NFC playoffs (left to right): The San Francisco 49ers, Philadelphia Eagles, Carolina Panthers, Seattle Seahawks, New Orleans Saints, and Green Bay Packers. Before we make it to the Super Bowl though, we need some eliminations! That’s where the first Wild Card Round comes into play. Four teams from each conference play each other in the first round, while each conference’s two highest seeds wait until the second round to begin play. As it works in the NFL, playoffs run by single-elimination. This means once you lose, you’re out. With four teams out (two from each conference), we’re currently in the midst of round 2. In this Divisional Round, the top seeds finally get a chance to play with two games already in the books after today. 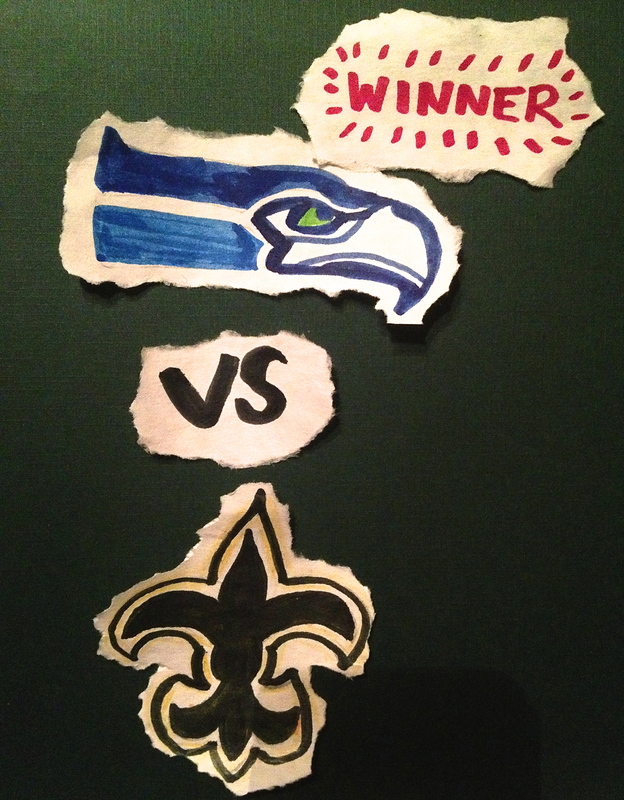 Today it was the AFC second seed, New England Patriots, playing the Indianapolis Colts and the NFC first seed, Seattle Seahawks, playing the New Orleans Saints. If you want to be super impressive and be able to recite the scores, the Patriots won 43-22 while the Seahawks won 23-15. Clearly, the Patriots and Seahawks displayed why they were at the top of their conferences by both claiming spots in their designated Conference Championships. Now the only questions left are: “Who will take the last AFC and NFC Conference Championship spots?,” and “Which two teams will make it the Super Bowl?” To give you an idea of what’s to come, let’s again get some visuals. Here’s what games are happening tomorrow, where two teams will make it to the Conference Championships! 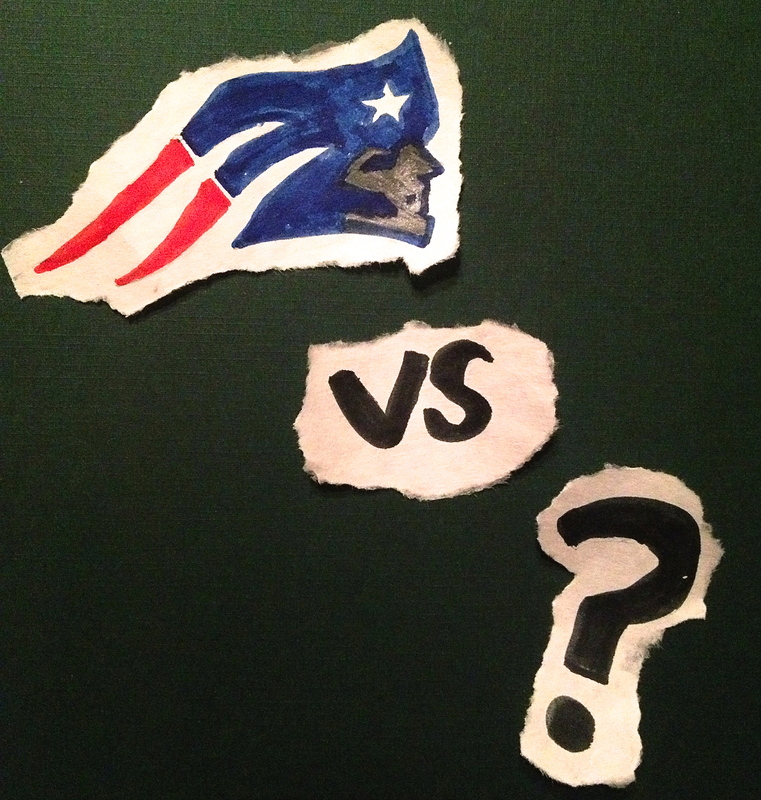 And looking even further ahead, who will be joining the Seattle Seahawks and New England Patriots in Round 3? 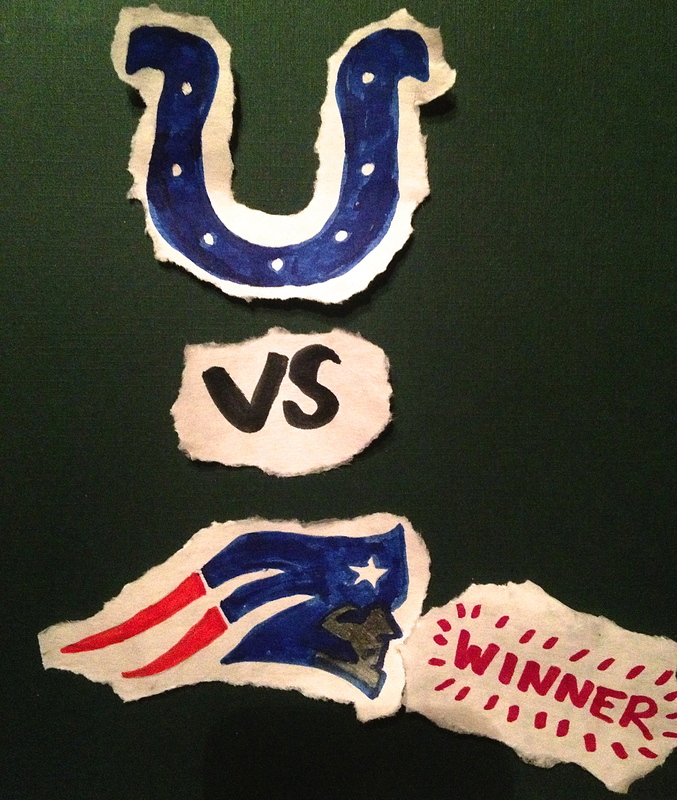 Soon enough the Super Bowl will be here and you’ll be able to say you knew how the two final teams got there! Everyone needs a visual aid once in a while, but if you want to “really really” know what’s going on in the playoffs, watch them for yourself! 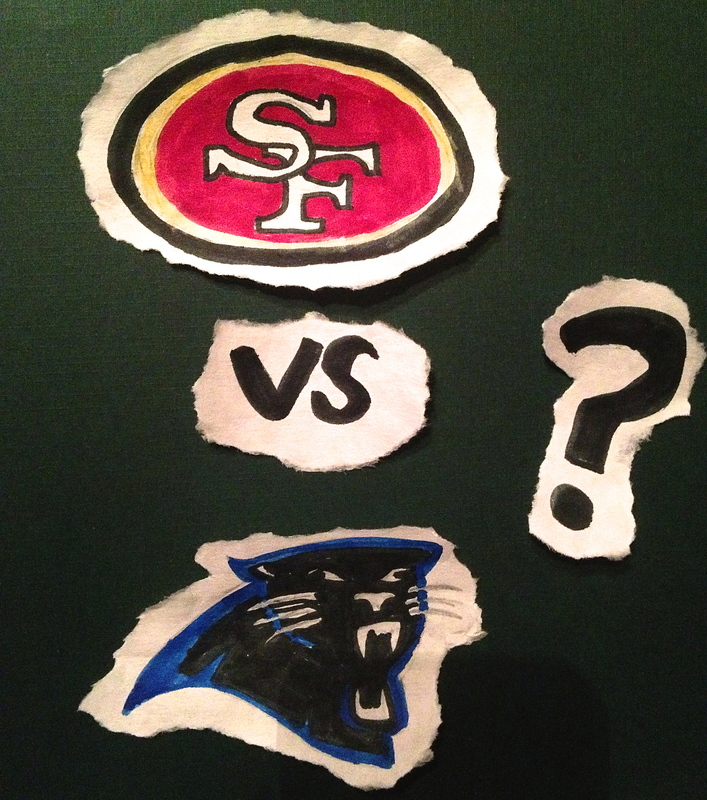 The 49ers and Panthers will be playing tomorrow at 1:05PM while the Broncos and Chargers will be playing at 4:40PM. I personally can’t wait for what will both be two great games!